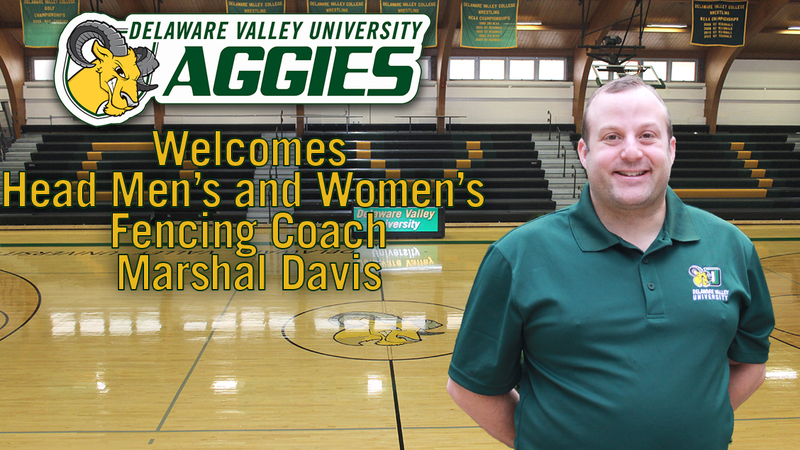 DOYLESTOWN (PA) – Delaware Valley University has announced that Marshal Davis of Jamison, Pennsylvania has been chosen as the first head coach in Aggie Fencing history. In early September, DelVal announced that it was adding fencing as a co-ed [men’s and women’s varsity fencing teams], intercollegiate NCAA sport with the intention to field a team starting with the 2019-20 season. Davis will immediately begin to put the program together, including the recruitment of prospective student-athletes. “I am honored and extremely excited to get the opportunity to start men’s and women’s varsity fencing teams at DelVal,” Davis said. “Fencing is an incredible life-long sport and I have been committed for many years to the growth of this sport at the club and NCAA levels. I look forward to bringing an awesome, intercollegiate fencing experience to the DelVal community, Doylestown and Bucks County. Davis has been a fixture in fencing in the Philadelphia area, starting with his days as a competitor and as a coach when he founded the competitive Temple University club team after fencing for the University of Florida Gators Fencing Team, where he was men’s sabre captain his senior year. He started the Temple program from scratch and led the team to compete at national and conference club championships. As a fencer, he was the team’s Most Valuable Player in 2004-05. In 2007, Davis moved onto Swarthmore College with the charge of building and coaching men’s and women’s fencing club teams at the Division III school. He built the program from the ground up and, in just the fourth year of its existence, the team finished sixth overall in the United States Associate of Collegiate Fencing Clubs (USACFC). In 2013, Davis took a squad of fencers that had never competed before attending Swarthmore and they went onto win a bronze team men’s sabre medal at the USACFC College Fencing National Championships. The team also won three consecutive SAC conference championships during the nine years that Davis was at Swarthmore. From 2010 to 2012, Davis also assisted with Division III Haverford College’s NCAA men’s and women’s fencing teams. The team won the Mid-Atlantic Collegiate Association (MACFA) conference championship both seasons. Davis has also been a fencing coach on the national level for Team USA. In 2011 at the European Maccabi Games, Team USA won medals in all three team events (gold in foil and epee, bronze in sabre) as well as 12 individual medals in six events. Davis then led Team USA at the World Maccabiah Games in 2013 and they won five gold medals and one silver medal in the six team events. Fourteen individual medals were also won by members of Davis’ squad. Davis has coached and served as president of the Liberty Fencing Club in Warrington and Haverford, Pennsylvania since 2010. He is the CEO, attorney and managing shareholder of Davis Law in Jamison. Davis earned a Bachelor of Science degree in accounting from the University of Florida in 2002. Three years later, he earned his Master in Business Administration from Temple University and then attended Temple’s James E. Beasley School of Law, where he earned his Juris Doctor degree in 2005. At Temple Law, Davis went on to earn a Master of Laws in Taxation and an Estate Planning Certificate in 2009. Davis is also licensed to practice law in Pennsylvania, New Jersey, and in federal court (EDPA and WDPA).